NHSRCL to recruit about 3500 people will directly and more than 10 thousand people indirectly for operation maintenance of the Bullet Train project. New Delhi, Metro Rail News: Construction of the Mumbai–Ahmedabad high-speed rail corridor will begin soon. The land acquisition for this project will be completed by this month i.e December 2018. The first high-speed train is scheduled to leave for its first run on 15 August 2022. According to our sources, high values tender for this project will be floated from January 2019. Work will start from January According to the Achal Khare Managing Director of the NHSRCL the company will start issuing high-value tenders from January 2019. Tender document preparation work is going very fast and experts have been assigned to complete this task Vadodara this monththe i.e. December. It can take two to three months to open the tender. After this construction work will be started for the bullet train project. In order to give training to personnel for the operation of the bullet train, a training center has been set up in Vadodara. A track of about 200 meters bullet train will be prepared here by February. To prepare this track, 20 slabs ‘Made in Japan’ have been imported. How to add these slabs, what kind of fitting is used in it and when preparing track for bullet train, what are the things to keep in mind? All these things will be trained here. 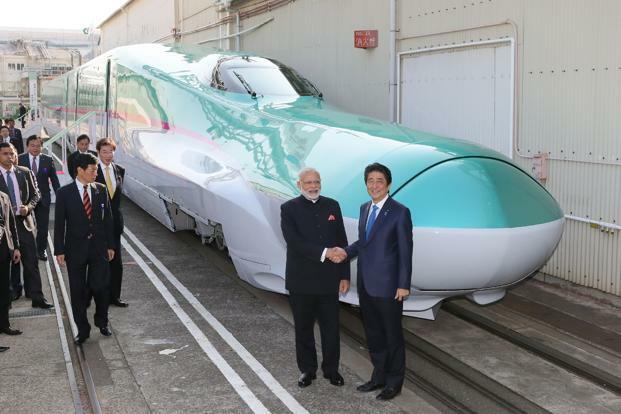 Japanese experts will extend help Japan will specialize in the expertise of Indian architects in developing 12 railway stations of the bullet train. In the meeting of the Mumbai Metropolitan Regional Development Authority and the Gujarat Urban Development and Municipal Commissioner, it was decided that the expertise of Japan experts in preparing the architecture of the bullet trains station and the development of the surrounding area will be taken. Ahmedabad-Mumbai bullet train project proposal was announced in 2014. It was planned from 2010. It will be constructed with a huge amount of Rs 1.10 lakh crore, of which nearly 20 percent of the amount will be taken from Japan as long-term easy loan. There will be eight stations in Gujarat on Ahmedabad-Mumbai corridor- Vapi, Bharuch, Vadodara, Anand, Ahmedabad, Bilimora, Surat, while there will be about three stations in Maharashtra. bullet trains will be connected to metro, bus the and other transport modes. There are 12 stations for bullet train between Gujarat and Mumbai, which are Bandra Kurla Complex, Thane, Virar, Boisar, Vapi, Bilimora, Surat, Bharuch, Varodara, Anand, Sabarmati and Ahmedabad. My name Bharathi raja . I’m finished Diploma in mechanical engineering 2015 pass out student. Experience at Mechanical maintenance at three years experience.